Blue race course bleachers lining the harbor. Our luck held: we happened to visit Cannes about a week before the international film festival swamped the city and we were in Monte Carlo 10 days before its 63rd Grand Prix race around town. Being more curious about how things work than wanting to be in the center of the action, I was delighted to visit both towns before, rather than during, their trademark events. In both Cannes and Monte Carlo it was engrossing to watch the metal scaffolding going up and to see extra event space being created by constructing temporary platforms over sand and in the sea itself. Both cities willingly give away the hearts of their communities for the glory of their internationally famous annual spectacles. In Monte Carlo we rode our bikes on much of the race course--a race course that consumes many of the city streets in this 3/4's of a square mile country. By the hour we watched the roadways methodically being transformed into a race course. 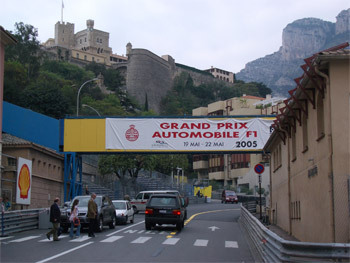 Five-storey grandstands loomed up around the tall sidewalk pine trees; temporary metal-walled buildings serving as pit stops were getting their finishing touches; metal barricades reinforced or protected existing walls; moveable concrete barriers lined some stretches of the streets; and numbered solid metal gates were coming out of storage. Bill pointed out the starting line as we cruised on the freshly sealed pavement with pairs of almost adjacent 3-sided slots painted to set the starting positions of the cars. I found it exciting to ride under the huge promotional banners that spanned the streets on erector-set-like skeletons even though I'm not a racing fan. And if we had missed the dates on the banners, we were reminded in the grocery store by its signs plastered everywhere informing shoppers that there would be no home delivery of purchased goods during the annual 3 day event. All of the country's preparation for the event would accommodate 150,000 spectators for the race on the 2 mile course that would be circled for a little less than 2 hours. This race course banner doubles as a passageway. As we walked and rode the course and studied the behind the scenes details of the preparations, I hoped that we would have a TV on race day so as to watch a little bit of it. It would be like looking at a photo album as we'd be pointing out familiar landmarks on the screen that we were seeing in person. 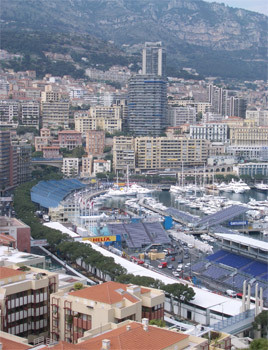 From the port where the grand stands were set up, the look up the hill at the country of Monaco was like looking at Hong Kong: very vertical. But the next day on foot we learned that almost all of Monaco's "skyscrapers" were only 15 to 20 stories high and it is the very steep slopes that they are crowded upon that makes them look like bigger buildings than they are. Like Hong Kong, space is at an incredible premium in Monaco and it is awesome to study how they have dealt with their limited land. Playgrounds for the schools are contained within the footprint of the building like a parking lot would be, either on the ground floor or on the roof. One ravine that probably once only had a bridge crossing it was partially filled in by over 20 stories of buildings beneath the roadway, with a couple of streets crisscrossing the structure at lower levels. We didn't see any single family dwellings but instead tightly packed apartment buildings trekked up the steep slopes. A commentary on both the steepness and spiffiness of Monaco was the 15 free public elevators ready to whisk walkers wishing to avoid hundreds of steps on the switch-backed streets and into the maze of subterranean levels of the city. It's pristine and efficient image was reinforced as we gradually learned that in Monaco you are never far from a free public toilet. The new port and high rises on reclaimed land. Exploring the little country added to its intrigue. We were surprised to learn that during the rein of the just recently deceased Prince Rainier III, Monaco had literally expanded its turf. A reclaimed land project of his in the 1960's added a second port and increased the size of the country by a whopping 20%. Another port-based project is in the process of adding an additional 17% to the size of the country with much of the new infrastructure catering to cruise ships. Our first fun hour of taking in all that is different about Monaco was interrupted by the security man who tried to kick us out of a small but lovely park. His lack of English and our limited French just barely allowed us to negotiate for a brief stay. I was going to sit on a bench in the shade with the bikes while Bill located a hotel for us a few blocks away in Beausoleil, France. When we protested leaving the park the guard offered a 5 minute stay. We pressed for more time, settling for 10 minutes knowing full well it would be longer than that. But fortunately the guard was content with monitoring me as I read and we overextended our welcome. Some of his words that we caught suggested he was concerned about us eating in the park, though he didn't shoo out other visitors with food. I suspect that though we work hard to always be neat and clean that being bike tourists was just too low-brow for Monaco's carefully crafted image. Like this park's image, Monaco is well protected and noted for its non-existent crime. 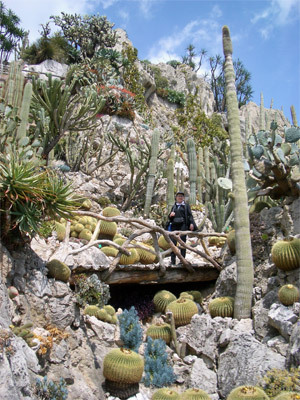 Vigilant uniformed guards kept the cactuses safe in the exotic garden as well as the kids in the pocket park used as an after-school playground. Though there was no border crossing, the street corners at the edge of the country's invisible border always had an attentive man in uniform standing by. I was surprised to see that the school kids didn't wear uniforms as I assumed they would in such a controlled and well-ordered country. After our rude welcome in the park, we were relieved to cross the invisible line back into more tolerant France for our lodging. And invisible that line is. We looked carefully for clues as we walked the 3 blocks to a food market and decided that the border between France and Monaco must be somewhere in the street on to which our hotel fronted, though there was absolutely nothing to announce the national borders. But lower hotel prices were a distinct advantage of being across the boundary into France. But I'm sure it was the upscale shoppers from Monaco that were the target market of the frozen-foods-only store 2 blocks into France with its eye-popping selection of goodies. If we'd had access to a microwave oven, we'd have done more than ogled the brochettes of fish, the big assortment of frozen mushrooms, and many lovely heat-and serve entrees. Overall, Monaco had that pleasant, well-groomed ambiance of a resort without being too snobbish feeling as we strolled the sidewalks. The buildings were all well maintained, the public plantings were manicured, and those distinctive unpleasant odors that we are accustomed to smelling as we walk in European cities were absent. Monaco has the perky fresh-look of a vacation wonderland but it is overlaid with the welcome bustle of a city with some substance. The boutiques for the filthy rich were almost all contained within indoor shopping centers rather than in street-side shops so the lopsidedness of the economic scale doesn't shout at one every minute. Almost all of the people on the street looked like regular folk rather than being dressed to kill. And the relentlessly steep incline of the country, the plantings and the ever present views of the Mediterranean draws one's attention to the natural beauty of the area rather than the wealth of its guests. 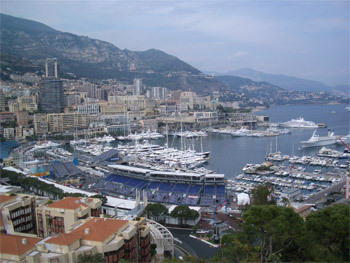 Monaco is set on an especially attractive patch of Mediterranean coastline. The rocky slopes are curved like a Roman amphitheater around the sea and the urban development doesn't dwarf the natural beauty of the area. And despite the preciousness of land in this speck of a country, Monaco has augmented its good looks with lovely green spaces. At first I wondered how tiny Monaco could squander so much of its precious bits of land on its lush gardens and parks, but as we became more familiar with the city, we realized that few if any of the green spaces had much terra firma beneath them. The serene Japanese garden with its tea house and water features was atop a 9 storey parking garage even though the garden was at street level. We guessed that another narrow specimen garden with winding paths and sea overlooks probably straddled the oceanographic museum. I believe the park the guard tried to shoo us out of was built over an underground shopping mall. We unexpectedly enjoyed the exotic garden of cactuses that clung to one cliff face and could only wonder what was underneath it.. But we could see from that delightful though narrow garden that one of the green spaces far below us was atop a new shopping mall. And we assume that other commercial properties were hidden under the many other lush and manicured hillside parks. 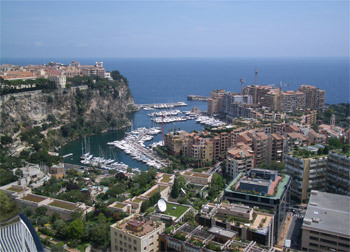 If you are in Monaco for long, it needs to be understood in 3 dimensions, not the 2 that will do for most urban spaces. Knowledge of all the indoor and outdoor escalators, elevators, the extensive network of stairs, and quirky little passageways would need to be mastered to efficiently navigate Monaco on foot. As novices, we gave up several times trying to find these special routes and walked the long way around or up. And more than once we looked at the map again and looked at the road 5 stories below us and realized that we wanted to be "down there" but couldn't find the needed secret door or passageway. 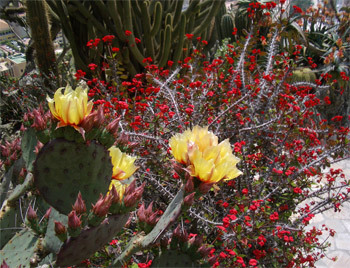 More specimens in the Garden. By our standards, the missed opportunity in this cleverly layered and well-policed little country was in not banning the loud, dirt-bike motorcycles. Too many of the 2-wheeled, motorized vehicles in Europe are deafeningly loud even at 20 mph and are especially brutal to the ears in the echo chambers of narrow streets lined with tall buildings. It seems that the Monaco police would have no trouble enforcing a noise abatement program with so many uniformed and plainclothes security people prowling their few streets. At the very least, they could limit them to the main international road through the city. But perhaps that would seem hypocritical in a country that host's a Grand Prix. The yachts had kept getting bigger as we traveled east along the French Riviera and by the time we reached Monaco they were the size of cruise ships and passenger ferries. We assumed that the ships with fewer life rafts and with helicopters on the backend were all private yachts. One had 7 other boats on the stern deck: 2 lifeboats and 5 boats with muscley inboard or outboard motors. One of the smaller yachts had 2 boats stowed in its stern "garage". Another had a small fleet on the bow deck with a winch to lower them into the sea. Of course we couldn't inspect the really huge yachts as they were either buttoned up tight or so big that they were anchored outside of the harbor with the cruise ships. Almost all of the big yachts looked like the owners weren't on board but many of them were being fussed with. Teams of workers were washing and vanishing some of the yachts and others looked like they were being readied for use. A couple even had phones on chrome pedestals on the dock, presumably so guests could ring to be allowed on board. No doubt almost all of these yachts will be abuzz with guests and owners next week as they watch the Grand Prix from onboard. And like Andorra, the car dealerships on the main streets in Monaco weren't Toyota and Citroen but Maseratti and Rolls Royce. And plenty of otherwise rarely seen Bentley's, Bugati's and Ferrari's also zipped by on the roads. The old harbor under expansion with some of the race course. Though we weren't particularly envious of the hotels, homes, yachts and cars of the well to do, we couldn't help notice them all around us almost every day that we traveled along the Riviera. As we repeatedly contemplated the daily lives of the thousands of outrageously wealthy people whose toys we were seeing, Bill summed it up: "Though it is possible to have enough money it appears that it's not possible to have too much." We were content, but we trusted we too could figure out how to spend piles of money given the opportunity. We have just said our good-byes to the Dolomites in the Italian Alps and are part way into our week in southern Austria along the Gail and Drau Rivers. When we leave Austria and enter Slovenia, we will finally turn south with Istanbul more squarely in our sights. After about a week in Slovenia, we'll begin a several week tour of inland Croatia.